Watch Mitski Perform “Nobody” and “Two Slow Dancers” on Jimmy Kimmel Live! Mitski is wrapping up her best year to date as an artist with a late-night performance on Jimmy Kimmel. 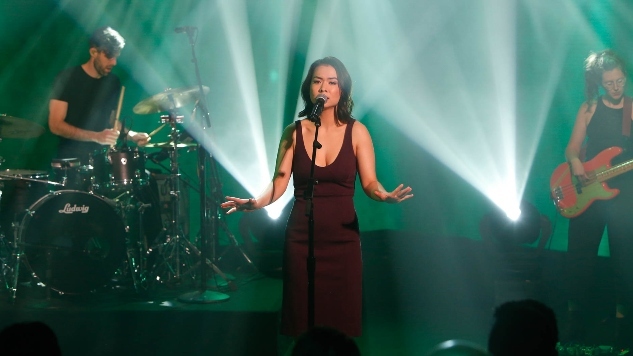 Thursday night, Mitski made her Jimmy Kimmel Live! debut as musical guest in support of her latest album, Be The Cowboy. For the first time on television with her full band, Mitski delivered a stunning performance of album standout “Nobody,” while additionally performing the quieter “Two Slow Dancers” as a web exclusive. The song choices speak to all that Mitski is capable of as an artist, from disco to the more unplugged. Paste recently ranked Be The Cowboy the sixth-best album of the year. Mitski’s “Nobody” came in seventh on our list of the best songs of the year. There are a lot of unhappy people in the songs on Mitski’s new album. Some of them are Mitski herself, but not all. Belying the usual assumption that any woman who writes first-person lyrics is singing about herself, the 27-year-old singer-songwriter has said that many of the songs on Be The Cowboy are experiments in writing fiction. Let’s call it a successful experiment. Whether she’s singing about herself or creating stand-ins that feel just like real people, Be The Cowboy shows why she is fast making herself into one of the most interesting songwriters of her generation. Following a completely sold-out fall North American tour, Mitski will continue on the road with a just-announced spring 2019 tour. The tour will consist of cities not yet visited in support of Be The Cowboy. See both of Mitski Kimmel performances and revisit her 2015 Daytrotter Session below.